So one afternoon a few months ago, we piled into the car, drove to the trendy Airstream-turned-coffee-shop where a local CSA farmer, Cindy, was selling tomato and pepper seedlings from the back of her delivery truck. We bought four tomato plants (Cherokee, Mark Twain, Lillian Yellow, and a roma) and one sweet red pepper plant, then we went out to buy the containers and the plain soil Cindy recommended. We planted them and topped it all with homemade compost, then regularly doused the seedlings in watered-down fish emulsion. Fish emulsion is exactly as lovely as it sounds: Although it looks like bottled diarrhea and envelops the deck in the sweet aroma of fresh death, it also organically fertilizes like nobody’s business. Our plants thrived. We had fruit production before anyone else in the neighborhood. Recently, though, some of the leaves began to wilt at the ends, turning yellow and brown then dying—just at the tips. Then the plants started to droop, and became sparser by the hour it seemed. I religiously pruned and paid close attention to the watering. I was worried that our sunny deck was scorching the leaves, just like that one time Noah thought it would be a good idea to give our low-light houseplant a few hours in the smoldering fires of hell sun on the deck and nearly killed it. 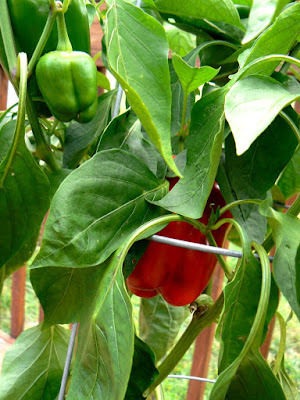 Curiously, though, the sweet red pepper plant continued to thrive. Seamus: Oy, Paddy! There’s somefin wrong wif this potayto! Paddy: Jaysus, Mary, Joseph, and all the saints and martyrs! It’s the blight! And then everybody starved and died. I would have thought that tomatoes were far more like, say, anything other than a potato, but apparently I would have been wrong. Apparently, tomatoes and potatoes are like first cousins. Being Irish and believing strongly in the merits of the potato, I was shocked to learn this, since for most of my life I’ve been suspicious of the decidedly Mediterranean fruit. The heirloom varieties are what changed my mind. My tomatoes caught the blight. The late blight, to be exact. The selfsame late blight that caused The Great Irish Potato Famine. I became suspicious when all four of my plants stopped thriving last week. I became even more suspicious when I came across this post on Food on the Food. I became convinced when I Googled “late blight tomato plant symptoms” and felt nauseated by the grisly images of withered and be-spored tomato plants, because I’m lame like that. The photos looked just like my suffering tomatoes. The only thing to be done was to (ceremoniously) stuff the diseased plants into trash bags so as to limit their threat of sending their spores into the great grassy beyond. No circle of life for these poor guys. Ashes to ashes, dust to the city dump. You know, I was surprised about how sad I was. I’d nurtured these plants from seedling, I’d fed my family with their early yields. I had dreams of bringing large baskets of tomatoes to work—all the ones that we wouldn’t be able to eat, because the harvest would be so plentiful—and putting up a little sign that read: “Home-grown heirloom tomatoes, free for the taking!” And then all my coworkers would love me, and fame and fortune would providentially soon follow. Alas, those dreams are gone. I can't imagine the depth of devastation a real farmer must experience when she loses a crop. When Noah began to snip off the stable yet declining branches of the plants, a song slowly swelled within me, and I had to let it out: With the addition of just a few on-point word changes, my plants were destroyed to the sound of Madonna’s “I’ll Remember,” aka the theme to one of the greatest films of all time, With Honors, starring Brendan Fraser and Joe Pesci. After I'd finished (singing), Noah rolled his eyes, then hauled the four unfortunate vegetables to the garbage can. "It's okay, babe," he reassured me. "We've still got the peppers." That would piss me too. Talking as someone who has only recently ventured into growing veg et al. Hope the peppers continue to thrive, and taste ace. Now that makes me want to buy that CD! Poor tomatoes! Maybe our economic downturn is due to THE GREAT TOMATO FAMINE. Maybe soon we will all be invading Ireland to find "the new sod"! We did not plant anything this year. 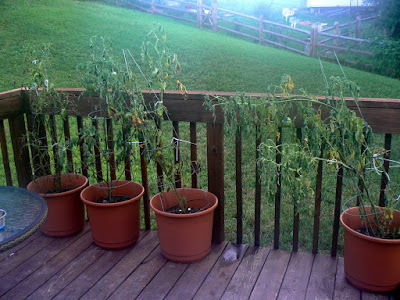 Tomato plants are a stable), but we have have had a rainy summer and they would have not done well anyway. The blight, she has the blight! unclean unclean!! I've never been successful with tomatoes, i don't think we have the sun for it. Bad luck old girl! There's always next year. Our tomatoes are only flowering now, I reckon my chances of getting a crop are zero. Bleck. The same thing happened to mine, except I didn't know it was the BLIGHT! Jaysus. My tomatoes are just short, sad, and not bearing any fruit. And now I'm grateful for that. Also Brendan Fraser is my secret husband. YUM. SPD—The peppers do taste ace! Thanks for your well-wishes. Anon Mom—I believe those were Madonna's best years. 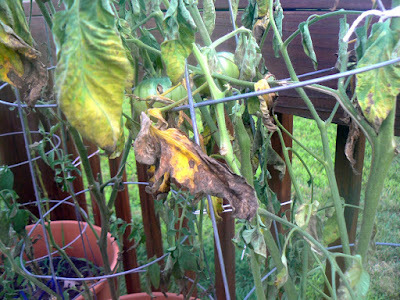 Slamdunk—Yeah, we've been hit hard by rain too, which of course makes the conditions even more perfect for late blight. Dan—Perhaps I'll take up chickens. Catherine—My hopes were so high early in the season, and I was oh so smug. Tina—Don't forget Mary, Joseph, and all the saints and martyrs. Sal—I know I could be flogged for this, but I loved The Mummy! I read this to Ben and he lol'ed. ROFL, I love the song at the end. Madonna would be proud. You know, the American Chestnut has been nearly obliterated in the wild because of a form of blight brought over by Europeans a couple centuries ago. Sad, sad story. Our Walmart tomato plant had the blight too. It produced three anemic looking tomatoes before it passed on - but a squirrel got the best looking one. Oh Erin. I'm so sorry for you tomato-y loss. I had dreams of homegrown tomatoes this year too, but laziness sabatoged my dreams. Next year, friend. Next year. Having had a patch of the sahara at midday as a garden at our first house, I feel your pain. 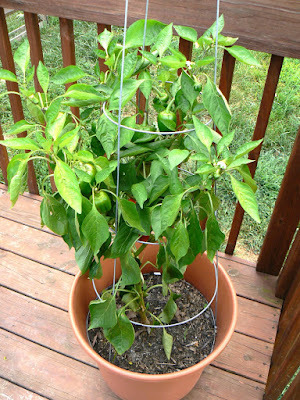 Great year for sweet, banana and jalapeno peppers. Our container planted grape tomatoes are doing fantastic this year. Big beautiful clusters along the vines... and we have yet to taste a single one. They disappear before fully ripening. Borrowing from your latest post, !@#&! *@% chipmunks. Strange, the cursing behind the symbols doesn't actually take away the pain of having to buy grape tomatoes at the store today. BTW - our deck was JUST big enough to put one of those nice canopies from home depot on - and low enough that we were able to take off the railings. Eliminated our deck-on-the-sun experience completely! Maybe that would work for you? Ben—Noah predicted that this post would hit home with you. Bug—Apparently the diseased plants were grown in the south and shipped to Walmarts, Lowe'ses, Home Depots, etc. Although ours weren't from there, the spores can carry up to 30 miles. So we're all pretty much doomed. Jen—Our deck is about 3 feet off the ground (our house is partially on a hill). But I have considered the canopy option. I will keep you posted, now that my dreams of container tomatoes have withered in the blistering sun.